Explore one of Indonesia's great natural wonders, the 'Blue Volcano' known locally as Kawah Ljen, a spectacular volcano that has stunningly deep blue lava, thanks to its incredibly high levels of sulfur, causing blue flames to rise into the air. Travelling from Bali to Java by ferry with an experienced local guide, we explore the local villages of the Osig peoples, whose roots reach back centuries in southeast Java. Explore vibrant local markets and colorful Chinese temples on your way to Ljen crater on foot and four wheel drive, where you will see spectacular panoramic views of the crater and lake. This two-day trip with a private local guide includes transport by air-conditioned minivan, an overnight stay in a 4-star resort hotel plus meals, ferryboat and pedicab ride. 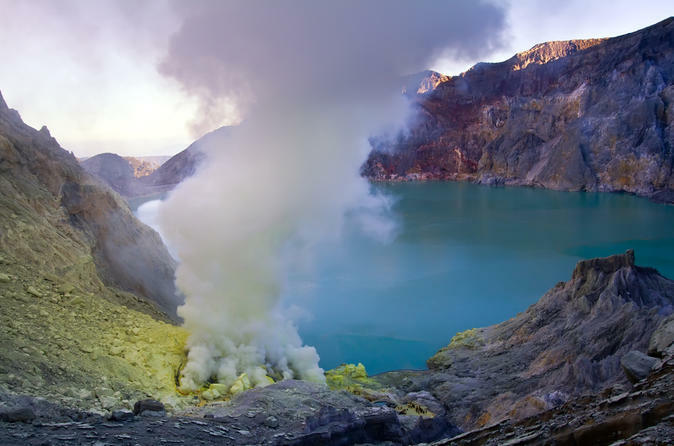 With all of your itinerary details taken care of by your guide, this overnight trip is a great way to explore Indonesia's culture and natural wonders like Ijen Crater.